On this Sunday, Fr. Andrew discusses the question, "Why do we talk about money in church?" On this Sunday, Fr. Andrew discusses what it truly means when Jesus says to us: You are the Light of the World. On this Sunday of of the Last Judgment, Fr. Andrew focuses on what the righteous and the wicked experience at the Last Judgment through the Incarnation. On this First Sunday of Luke, Fr. 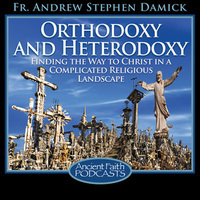 Andrew explores what Jesus uses to get into the lives of His first disciples.